It’s the second time police have been called to the address in recent weeks after a similar incident earlier this month saw the road closed while police negotiated with the resident- amid fears a gun had been fired. The loud bangs turned out to be fireworks. 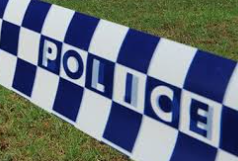 Police were called to the same home on Buttenshaw Drive just after midnight after neighbours reported a disturbance at the home- and were concerned for the welfare of the residents. He has been taken to Wollongong Police Station and charged with using a weapon to resist arrest and cultivating a prohibited plant.